Please, kindly note that our apartment has VERY COMPETITIVE PRICES compared to similar apartments in the same area or complex, which are rented per day, since our minimum stay is 14 nights. 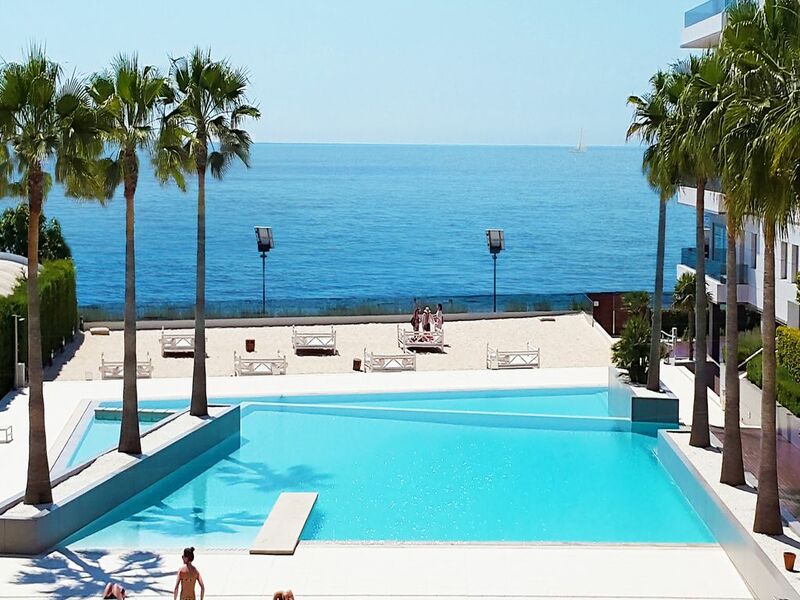 The "Royal Beach Luxury 3 Bedroom Apartment" with stunning front sea view, is situated in one of the most luxurious and fashionable complex of the island (Ibiza Royal Beach) with amazing pool, private beach, reception with concierge service and security 24/7. The complex is located directly on the beach, at the beginning of the famous Playa d'En Bossa, side of Ibiza Town, and it is a heaven away from the hustle and bustle of the island where you can unwind and relax, but at the same time is close to everything: a supermarket is a 2 minutes walking from the building, and also restaurants, bars and other shops are all within short walkable distance. The famous beach clubs and discos such as Ushuaia and Hard Rock are also within short walking distance, but far enough not to hear the noise.The fully furnished apartment has 3 double bedrooms: 2 with queen size beds (on request, beds can be made twins, instead of double in one of the bedrooms) and one with a double bed of 140 cm, 2 bathrooms (one with shower and the other with bath tub and shower), a large living/dining room, a separate fully equipped kitchen and a private terrace. From the living room, the terrace and the master bedroom you have front view of the sea and of the pool. The apartment has air conditioning, free internet wi-fi, washing machine, clothes dryer, safe, stereo hi-fi with I pod player, flat tv, dishwasher, nespresso coffee machine, blender, microwave, toaster, kettle, hair dryer. The centre of Ibiza Old town is easily reachable by car/taxi in 5 minutes, by ferry in 7-8 minutes, or, alternatevely, by foot in about 20 minutes. The taxi rank is on the next block. Ferries leave from the dock, a few meters from the private beach. Please, CONTACT US FOR ANY INFORMATION YOU MAY NEED. This apartment is rented in accordance to the Spanish law called "LAU".No hotel/tourist services, such as breakfast or daily housekeeping, are offered. Free Public Parking Spaces on the street near the Building or, alternatevely, on request, in the garage of the complex. A beautifull clean appartment with everything you need. We had a wonderfull stay at Ibiza because of this appartment. PLEASE, kindly note that our luxury apartment has VERY COMPETITIVE PRICES compared to similar apartments in the same complex, which are rented per day, since our minimum stay is 14 nights.. Electricty, air conditioning, water, wifi internet cost and taxes are included in the rate. A refundable damage deposit (between €500 and €800, depending on the length of stay) will be paid upon arrival and it will be refunded on the day of departure.